31 x 28 ½ in. 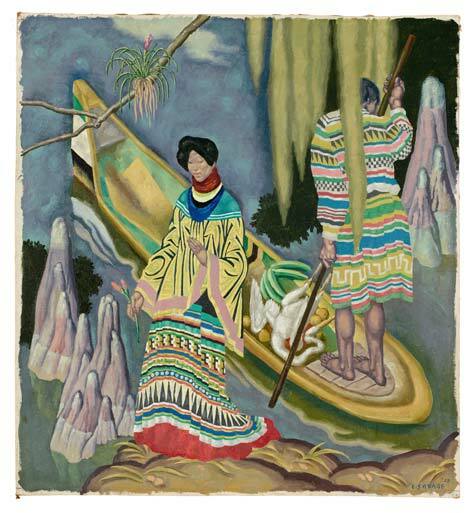 In 1935, American artist Eugene Francis Savage made the first of many journeys into the Florida Everglades to study the Seminoles. Inspired by his observations, he created perhaps the most extensive painted record of the Florida Seminoles from the early 20th century. These works reflect Savage’s concern for the plight of native culture as tourism, land development, and environmentalist debates that threatened their traditional way of life. Savage was especially drawn to the Seminoles’ distinctive colorful patchwork clothing. The art form developed in the 1910s as the Seminoles acquired hand-cranked sewing machines from trade posts in South Florida. The patchwork is composed of segments of colorful commercial cloth sewn into geometric designs that were based on nature. Inspired by these so-called primitive designs, Savage collapsed space by positioning the canoe at a dramatic angle and reducing natural forms into flat shapes and patterns.